These possum house socks are made with the same possum/merino wool as our gloves and sweaters. Soft and thick, they are perfect for keeping your feet warm on cold evenings. The non-slip grips are shaped in the koru design. Koru is the Maori word for the new unfurling fern frond and symbolizes new life, regeneration and growth. 40% possum fur, 50% Merino wool and 10% nylon. Sock length is 6 inches. Machine wash cold (gentle cycle), dry flat. Made in New Zealand. Lothlorian is a New Zealand company offering a range of possum/Merino woolens, designed and crafted in their specialised knitting plant located on the outskirts of Aukland. The blended yarn is 40% New Zealand possum fur, 50% Merino wool and 10% nylon to stablize and strengthen the yarn. The unique soft pointed ends and hollow core of possum fur provide an extremely light, soft and luxurious fiber. Lothlorian House Sock sizes are given by shoe size. If you are at the top of the range for a size, and your foot is wide, take the next size up. If you are at the bottom of the range for a size, and your foot is narrow, take the next size down. 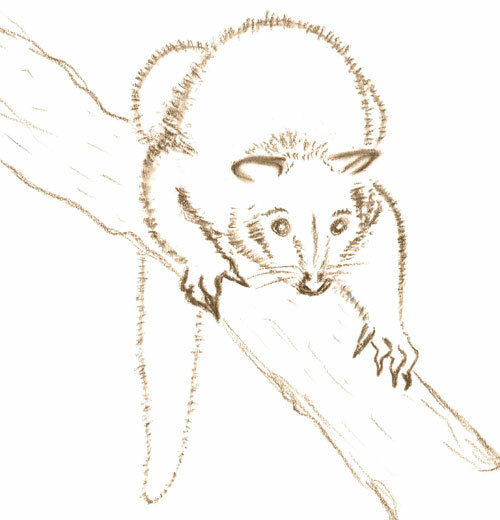 The Australian possum, a small arboreal marsupial, was introduced to New Zealand by European settlers in the late 1800's. Possums soon escaped and, with no natural predators, quickly multiplied to their peak population of around 80 million. The possums cause enormous ecological damage to plant and bird life in the native forests, threatening survival of native species including the kiwi. Humane harvesting of possums for their fur is one part of New Zealand's efforts to eradicate the Australian possum and preserve native environments. The possum population is now around 30 million, or about 7 possums for each New Zealander. The smooth fibres of possum fur have hollow cores and soft pointed ends. Possum fur blended with Merino wool and nylon for strength gives a luxurious yarn that is extremely lightweight and soft. The yarn wears well, is easy to care for and resists pilling.